Following on from yesterdays post, Still Life does not have to involve a studio, construction of an image and complex lighting. Still Life subjects can be “found” and photographed in situ. 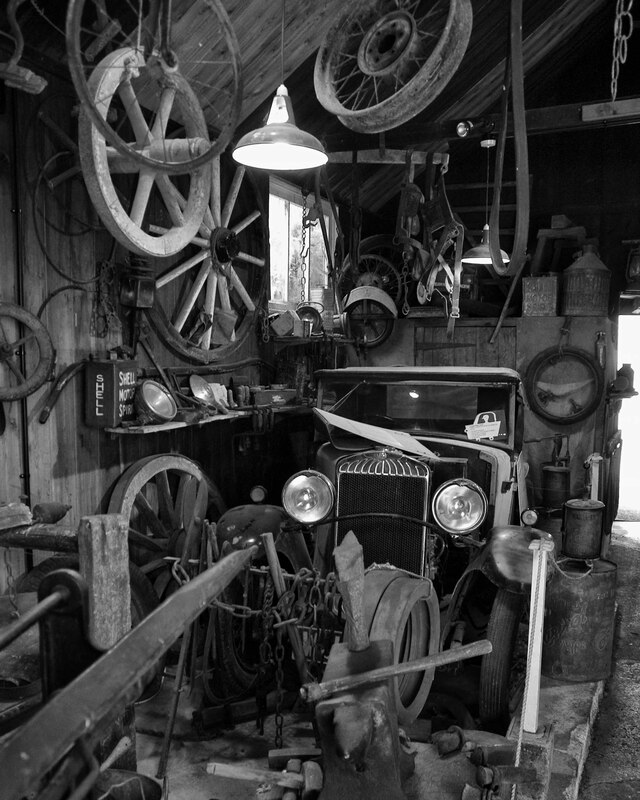 The image below is a garage scene at a museum of vintage cars. I found the scene by accident wandering around the museum and by composing the scene carefully I was able to use the overhead electric light as well as natural daylight from the window and door. Unlike the constructed still life posted yesterday, this is not a simple image as there are many objects clamouring for the viewer’s attention. The most obvious is that of the vintage car, and its round headlights. What makes the image work, in my opinion, is the repetition of round shapes from wagon wheels suspended above, to the light shade and wheels above and in front of the car.